Should I be at all concerned about this? Just got two emails from these people saying somebody logged into my account using one of my email addresses, one from China the other from Brazil. 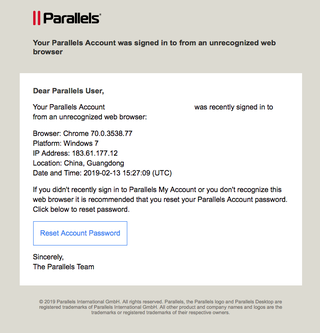 Parallels is a Windows emulation software for Mac, and I haven’t used it in YEARS. I know this particular email @ is out there because I recently saw a significant uptick in spam to this account. My sense is that I should just ignore this, as the email itself might be a scam. Thoughts?